Woodland Escape Glamping Holidays with hot tub are set in the heart of our wood in rural Somerset offering holidays in bell tents and yurts. We have taken the best bits of glamping and gone off grid. 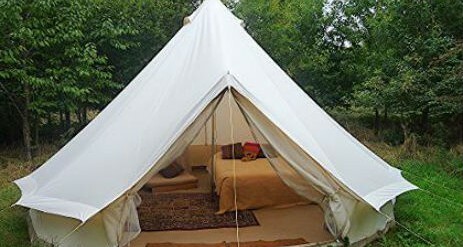 Woodland Escape Glamping Holidays brings you close to nature with our bell tents and yurts all nestled between the trees of our wood providing an ideal country escape. We have sourced renewable energy, minimising the glampsites carbon foot print whilst maintaining high levels of comfort for you during your stay. Whilst we are firm believers in renewable energy we also know that our guests want a comfortable experience so we include luxury portable showers and toilet facilities providing guests with the comforts you would expect. Each bell tent and yurt has it’s own solar power source providing plenty of light as well as a means of charging your phone if required, though we encourage our guests to have a digital detox. Feel free to borrow a game or book from us. 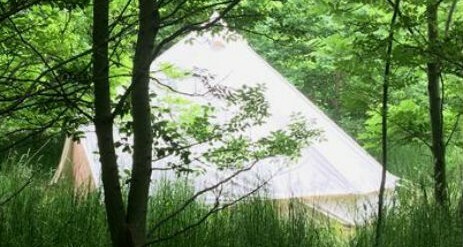 We have utilised over half a century’s experience that our family have in the holiday industry to design a woodland glamping holiday experience for you. What is more we have not just used our experience. Woodland Escape Glamping Holidays has been created based on the feedback from our guests at our families other sites and we therefore aim to provide what our guests have told us they want, a high quality glamping holiday, in a rural location with good facilities, which cares for our environment and has high levels of service. We look forward to sharing our rustic woodland glamping holiday experience with you whether you are joining us as a family, couple or group. 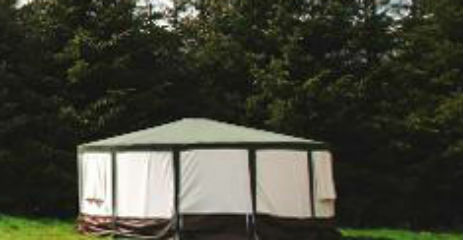 Combine the fun of sleeping outdoors under canvas with the the glamour of the exotic. Step into a world of Bedouin inspired luxury. 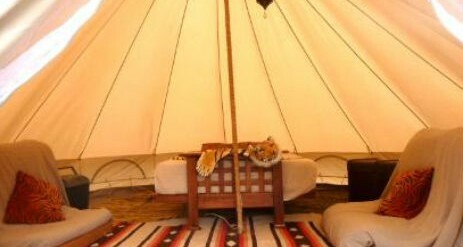 Whilst our bell tents each have the same equipment, each has its own woodland animal theme complete with mascot. Embrace a more relaxed style of living as you recline on futon day beds. The opulence of the Bedouin life style is here for you down to the patterned rugs, but with the added benefit electric solar lights and the solar power bank you still have somewhere to charge you mobile phone! Beds are set-up ready for you when you arrive and furnished ready for use, so you can just turn up and relax. 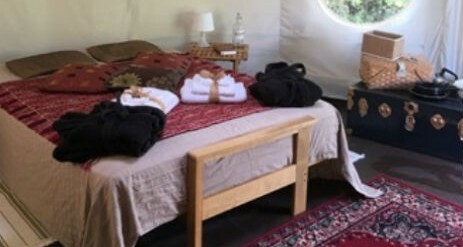 Our Yurts are snuggled in between the trees and inspired by the the original yurt concept from Mongolia. The yurts are insulated to minimise temperature variations due to their 3 layers of insulation (a thick outer canvas, an insulation layer and then the inter lining cloth). What is more our woodland glamping yurts have a see-through roof light so you can gaze up at the stars at night! All of the woodland glamping yurts and bell tents have full use of our luxury shower and toilet facilities. Our woodland Canvas Lodge, which has separate “rooms” and can sleep up to 6 people on a double bed, a double sofa bed and two single futon sofa beds. 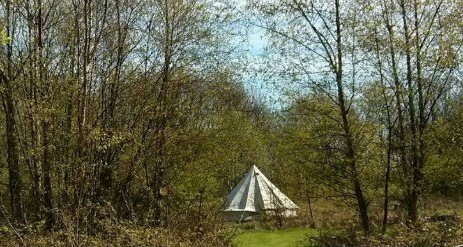 Glamping now available with exclusive hire of an off-grid wood-fired hot tub surrounded by trees. We provide gowns, towels and flip-flops with every hire! 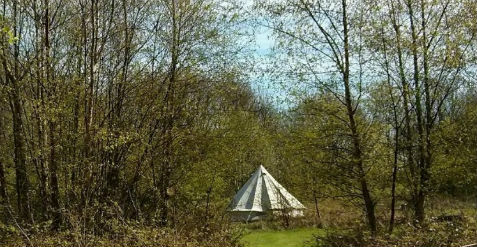 Our woodland glamping site is brilliantly situated to offer a variety of activities and attractions and we are only 25 minutes from the mystical site of Glastonbury Tor and King Alfred’s Tower. We are well placed for day trips to the Roman Baths of the ancient city of Bath. If you fancy venturing further afield we are also approximately 35 minutes drive away from Stonehenge. Just because you are on a woodland holiday, doesn’t mean you can’t do some retail therapy whilst you are staying with us. Clark’s Village Outlet at Street is approximately 25 minutes from the site and has a range of brand names from Jaeger to M&S. The local town of Yeovil also has a number of shops and restaurants and is approximately 20 minutes away. We cater for your dog like they were another guest. Each dog receives a dog bowl to use during their stay, as well as a yummy dog treat & a toy to keep! A small fee of £17.50 applies for each pet. This covers your whole stay. We also have plenty of lovely countryside for dog walking as well as local dog friendly restaurants and bars.